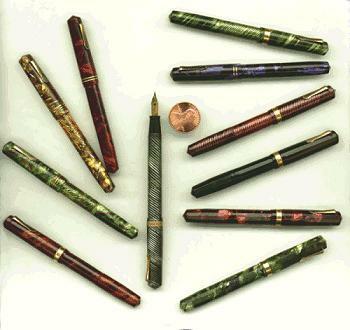 These attractive, colorful miniature fountain pens from the '30s came in a wide variety of colors and patterns. Bantams are bulb-fillers, filled by multiple squeezes of the rubber bulb hidden under the barrel's blind cap. Many have transparent or translucent barrels; some have solid 14K "0"-size Wahl-marked nibs, but most are found with unmarked nibs of gold-plated stainless steel. Facetted versions  miniature Dorics  were also made, as were desk pens and matching pencils. World's Fair collectors will want to keep an eye out for the specially-imprinted model made for the 1933 Chicago Century of Progress exhibition -- a boxed example is shown at the top of the page. 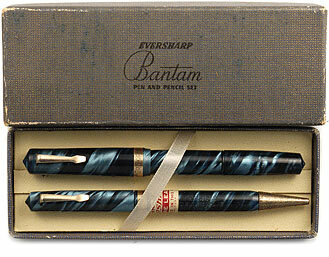 Note that even with this unused set, the plating of the pencil's metal tip shows some roughness, from age rather than wear. This is typical of plated metal of the era, so while Bantams' gold filled bands usually retain their fine finish, the clips and pencil tips -- gold plated rather than filled -- will often show some finish loss. The picture above should give some idea of the size and variety of these diminutive pens; they typically measure around 9.7 cm (3 13/16") long, closed -- just long enough to be usable with the cap posted. The bulb-filling system is shown below; the breather tube is visible through the transparent barrel. Note that the original factory bulbs were held in place not just by shellac, but also by a crimped aluminum band, which is often found still in place on unrestored examples.